It’s that time of the year again. The sun is shining, the flowers are blooming, and the tourists are arriving by the boatload (literally) into Stockholm. I have previously published a few short articles about Stockholm but this should be your starter as to the must see spots in the city. I visited all these spots several times because they *feel* Stockholm. And they lift my spirits on good and bad days. A ship that sank because it had too much ammo. The Swedes dig it up from the wet clay and put it in a museum! It is the museum I have been to four times. Nordiska Museum is the best museum for Nordic history and contemporary collections. Kaknästornet – Located in Djurgården, this radio/tv tower has a small cafe and restaurant to enjoy a 360° view. No, the tower does not rotate, you have to move your legs but it’s the best place to see Stockholm’s archipelago. I don’t care much for the food or coffee but I do love sitting down and watching the view. Drottningholm – The Queen’s castle is for the summertime only. Go for a stroll, take a jog, or walk the gardens; this is one of the few castles to experience a ‘Versailles’ of Sweden. Take a picnic lunch with you because the only place to eat is a quaint but touristy cafe. Tours of the castle are available during the summertime. 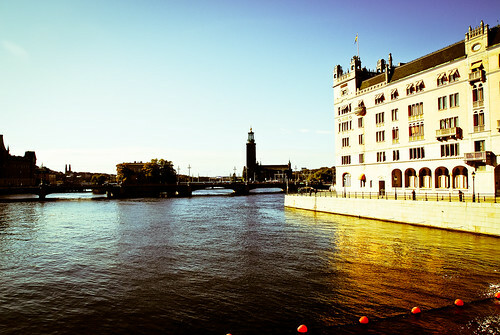 There are five bridges to cross from Stockholm central to Gamla Stan. All over their own special views. It’s one of the spots where you can be transported back in time and watch the world go by. Moderna Museet / Asiatiska Museet /Skeppsholmen – Even if you are not a modern art or Asian art museum fan, go to Skeppsholmen to take a turn of the island. When you get to the top, where Moderna Museet lays, hope into their cafetaria for a view to Östermalm. And play in the grassy area with the bizarre, colorful statues. The view to City from NE Södermalm – Walk from Slussen station and go up the street, Katarinavägen. After 7-8 minutes you will see the docking area for the cruise liners, Gamla Stan, Gröna Lund, and Skeppsholmen. Most often people take the street sea level route (Stadsgårdleden) but it does not offer the charm of the Katarinavägen walk. If you continue walking to the bend of the street, you can go straight (Fjällgatan) and head to Hermans for a fika, lunch or dinner. They have great vegetarian food and the perfect view. Here’s a big secret. The radio tower is one very cool place to hang out and have beer. It’s windy and full of moronic teenage boys but the view is fabulous. Gorgeous, gorgeous, gorgeous!!! I love just staring out at Stadshuset. Lilla Essingen strand – Packed on those days when Swedes sit out like solar panels, you have to get to Lilla Essingen’s strand early. There is no sand there compared to the other beaches, on Kungsholmen for example, but it’s just a fun spot. Take some grilling stuff and all the fixings, the local ICA grocery store doesn’t have a great selection so pack your meats, treats, and drinks with you. Humlegården – One of the few parks that has grass; real, long stemmed grass. I like to find a spot in the sun but close enough to a tree that I can hid under if I get too hot. During the summertime, it’s packed, surprise surprise, with solar panel Swedes. The upside is that there is a ton of hot Swedish men and women to stare at. Japp, delicious godis! Just shield your eyes away from the stekare. Eww! All these spots remind me of how beautiful Stockholm can be. To live on a city built of islands is an amazing experience. I’d like to add chilling on the water at Gamla Stan by Slussen. As you go by on the train, you’ll see hundreds of Swedes just Relaxing in the sun, legs dangling into the water. Thanks you for this post! I been curious about nice spots to check out in Sweden, if I do ever get the chance to go! Next Next post: A Call to Bloggers in Sweden – Join the Lost in Sweden Moosletter!